I want to share with you today some highlights from a wonderful vacation my family took last summer to Dubrovnik, Croatia. Dubrovnik is a charming small city on the Adriatic Sea (across from Italy). It was a major maritime power in medieval times. Today it is a fairy-tale tourist destination (but not overrun with crowds and high prices which you might find in more major European sites). My top photo is the Old Town itself, which was built 500 years ago, and has been well-preserved. You can walk around the old walls, which served to protect the city, and were never breached until the Yugoslav war in the 1990s when airplanes dropping bombs did what medieval enemies never could. The citizens worked hard in the last twenty years to re-build their city, which was heavily damaged in the war. They did an excellent job. Within the walls of the Old Town, you can find history, shops, restaurants, churches, medieval architecture and, most of all, people enjoying the outdoor spaces. I knew I had to write a story here. 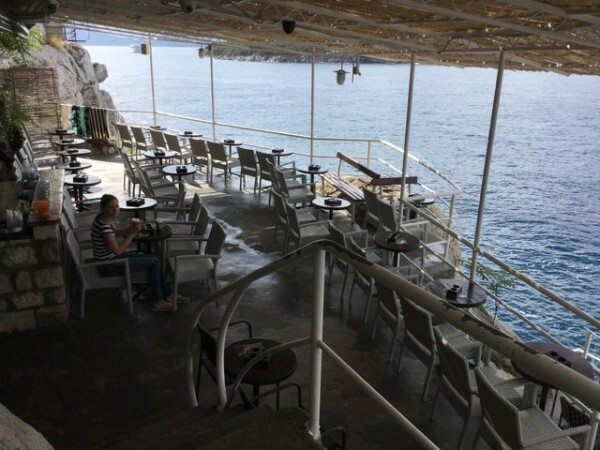 We found an outdoor bar perched on a cliff overlooking the Adriatic Sea. You literally have to go through a small tunnel in the outer walls of the old city to reach the bar. It’s called the Buza Bar and is a fairly well known spot where you can only order drinks. (There is no plumbing at the Bar.) You can enjoy your drinks at the bar or down on the rocks. I knew this was the perfect setting in which my hero and heroine could meet. 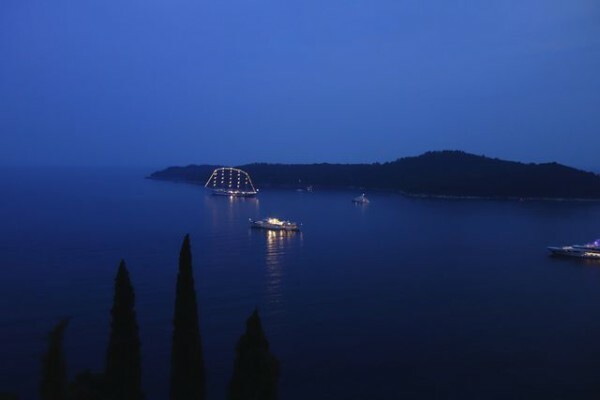 Dubrovnik is just as romantic at night, with fantastic views in all directions. My daughter took a photo of a gorgeous yacht all lit up, which we could see from our windows. I knew that this is where my hero and heroine could have some fun. 😉 After all, the hero is a billionaire, and this yacht is just one of his toys. Dubrovnik is the setting for my novella, Love Charm for Gillian. 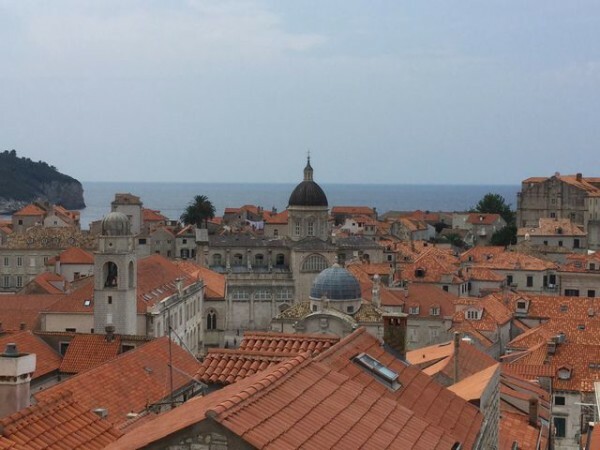 Gillian traveled to the Dalmatian Coast to close the door on tragedy. 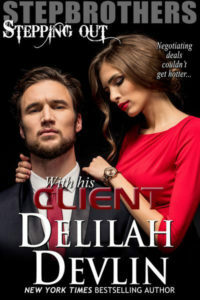 But an adventurer with a private yacht may be just the type of enticement she can’t resist…for better or for worse. 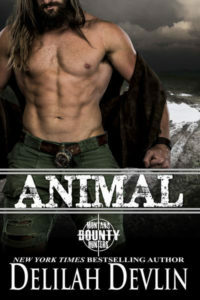 This story is available only in the all new anthology Tall, Dark, and Loaded, on sale for a limited time for only 99 cents. Thanks for joining me at Delilah’s today. Have any of you ever been to Croatia? Would you like to go? Where is your favorite vacation spot, either that you’ve been to, or would like to visit? Which photo that I’ve shown is your favorite? Please share. This entry was posted on Wednesday, January 20th, 2016 at 9:04 am in General. Tagged: Guest Blogger. You can feed this entry. Both comments and pings are currently closed. Hi Delilah, thanks for hosting me today!